Note: After visiting the cemetery on Saturday, Aug. 9th, 2014, we three widows were sorely disappointed in what we saw — or didn’t see — two years later. I sent this article to Doug Ledbetter, the director of the Ft. Rosecrans and Miramar cemeteries so that he would be aware of what I was going to write. He called me, and we discussed the conditions I have mentioned in this article. His responses are italicized. Two years ago this August I wrote my first article about the deplorable conditions of Ft. Rosecrans Cemetery. The cemetery has special meaning to me because my husband is interred there, and it will be my “home” when I leave my Pt. Loma home. Over the past two years I have written several follow-up articles about the grounds and have complimented the new director, Doug Ledbetter, on returning the cemetery to its pre-2012 standards. I recently received an unexpected call from Doug asking me if I had been up to the cemetery lately. I had not, but told him that three of us were going to visit our husbands that weekend because it had been a while since we had been. I told him that we were looking forward to the improvements we expected to see, and I would let him know our thoughts. It is only fair to tell you, the reader, that I sent a copy of this article to Doug before I sent it to the San Diego Free Press. Why? Because Irene, Candy and I were so disappointed by the condition of the cemetery that I felt I owed him an opportunity to know our feelings before he saw it in print. For the life of me I cannot understand what is taking so long to make the cemetery the prism of beauty it used to be. The scenery – the Pacific Ocean on one side of the road and San Diego Bay on the other are truly wonders of nature. 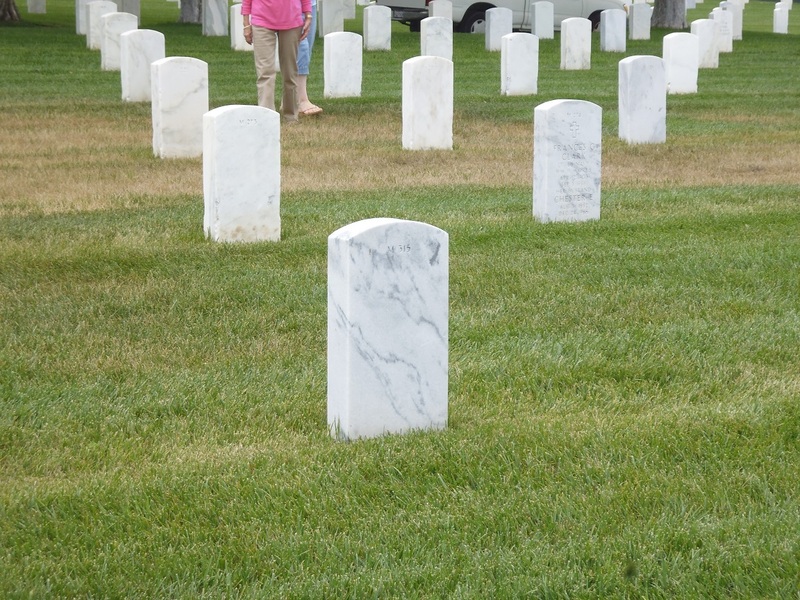 Who cares if the headstones are not perfectly lined up anyway? A small earthquake will probably adjust them and they’ll be out of kilter again soon. When Bob first died – five years next month – the widow support group I belonged to would go up to Ft. Rosecrans and have a picnic. We would sit under the trees, talk about the past, and in spite of the purpose for being there, would come away with a lightened spirit and a degree of serenity around us. Not so today. In the first place, many of the trees are gone. In fact, there is no tree that we can sit under near our spouses any more. They were supposedly removed because they were dying, and this was before Doug’s time as the director. The grass that died because of faulty sprinkler heads purchased in China, was no better looking today than it was two years ago. Dead spots all over; dead flowers left underneath the niches that looked like they’d died weeks ago; piles of rocks blocking the roads, making it impossible to safely drive around or exit the area. It’s been over two years and it’s as bad as it was in 2012. According to Doug, the rocks were placed where they are because when they were by the retaining wall they had the potential to cause a traffic nightmare. As a result, they have been placed further north so that they are not taking up driving space for those visiting the cemetery. We are currently in the middle of a drought and yet there was a faucet leaking water all over the grounds. Someone put a vase under the faucet to catch the drip, but it was full and overflowing. Doug said that he recently directed one of his workers to check for leaky faucets. This one was either not leaking at the time of the inspection or it was overlooked. He stated he would send someone out immediately to check on it. During our visit, we saw a shirtless man around the age of 40 in a white pickup sitting alongside the road where it said the road was closed. Even though we are three feisty women, none of us elected to see if he was wearing any pants. We were there almost 45 minutes and he never moved, until we decided to leave. He then opened his car door but never got out. You have never seen three older women move as fast as we did to get into the locked car and hightail it out of there. We were the only visitors to the cemetery at the time, and we wondered whom we might need to call in case there was a problem. Areas that had been renovated looked like they needed to be renovated again. In reality, there weren’t any beautiful areas that we could see, but we only drove on the east side of the cemetery because that is where our men are interred. But why the dead grass everywhere? Doug stated that “…the grass is not dead. It is ‘stressed. '” He said if it were to receive some water it would grow and turn green again. Why then, has that not been done? 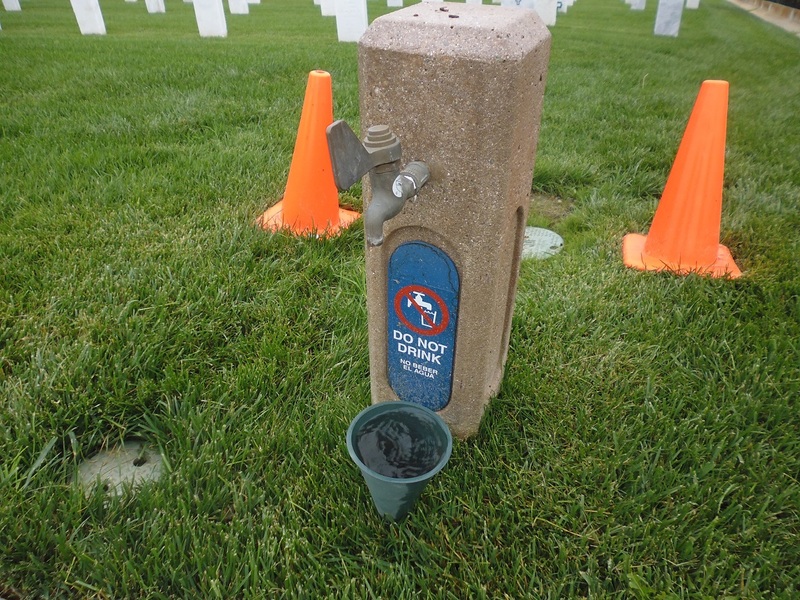 Doug’s response was that the National Cemetery Association had an irrigation specialist out recently who checked on the grounds to determine whether soil testing is necessary. It seems that there is some deficiency affecting this area that’s not affecting other areas of the cemetery. There’s also a program in progress where they are training the groundsmen in the proper care of the cemetery grounds. So then why haven’t the headstones been aligned yet? Why is some of the area newly dead, awaiting a realignment? Why are there no trees to sit under, no benches to sit on for grieving relatives and friends? Why are there grass cuttings all over the place that is not picked up, same as the flowers, now dead, that have been left behind? Apparently the two contractors responsible for completing the renovation to the cemetery grounds have had their contract extended. It was supposed to be completed by May 2014, but it is far from being done. This is in addition to the groundsmen that are responsible for keeping the areas clean. Well, if there are too few people to keep it clean, hire more people. If the people responsible for cleaning it up are not able to do so, hire someone that can. It seems to me that the May date was an extension of other dates that the work was not completed. How many extensions are there going to be given before the job is finished? Doug told me that an assistant has finally been hired for him. It’s about time. He’s been there over a year and can’t do the entire job himself, especially given that he’s also in charge of Miramar cemetery, which recently opened. There is no question that he has worked day and night on restoring the cemetery, but it’s impossible for one person to handle two large cemeteries. Miramar has had some of the same difficulties as Ft. Rosecrans, but it’s new and those problems are expected. Ft. Rosecrans is an old and established cemetery. While age has an affect on all things, one does not expect it to look entirely dilapidated compared to its newer installation. 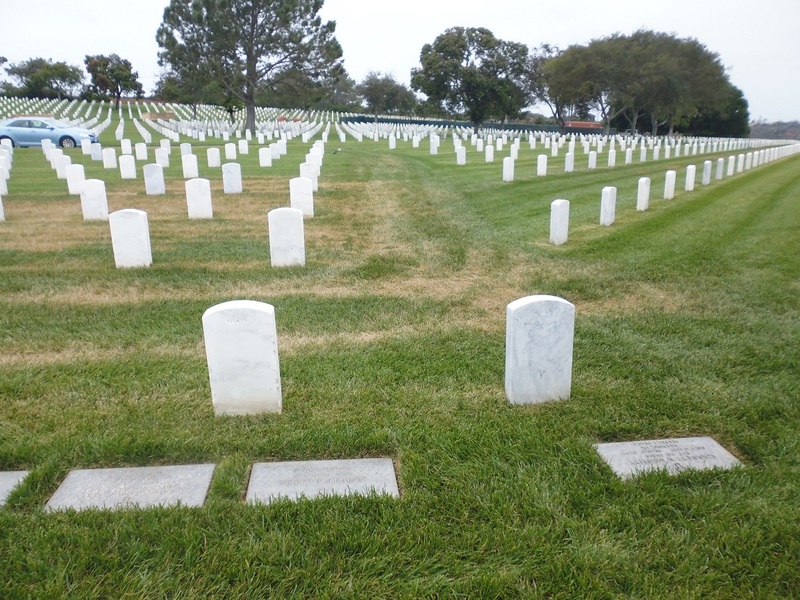 In the meantime, don’t expect to go to Ft. Rosecrans for Labor Day and see a nicely manicured cemetery. It just ain’t going to happen. Yes, it is being “worked on,” but let me remind everyone that the same contractor, the same crew, etc., has been working on it since before my first article in August 2012. Clearly the inhabitants of this valuable piece of property can’t stand up and protest. But what about the relatives and friends of those people planted in the ground. Doug can’t do it alone. Let people know that they have had enough time to complete this; demand that it be brought back to its original beauty now. Two years is too long to wait. And it isn’t even close to being done. 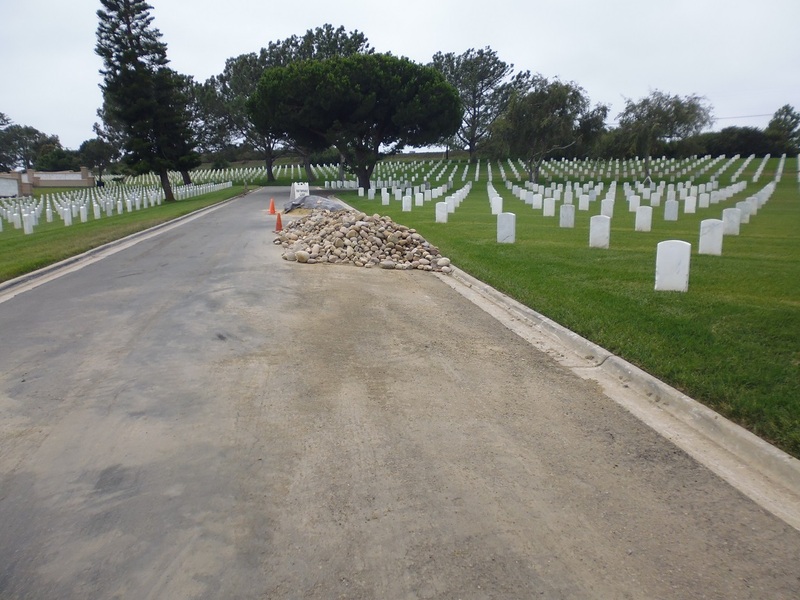 Dear Judy, Thank you for your efforts regarding the sad state of Ft. Rosecrans National Cemetery. 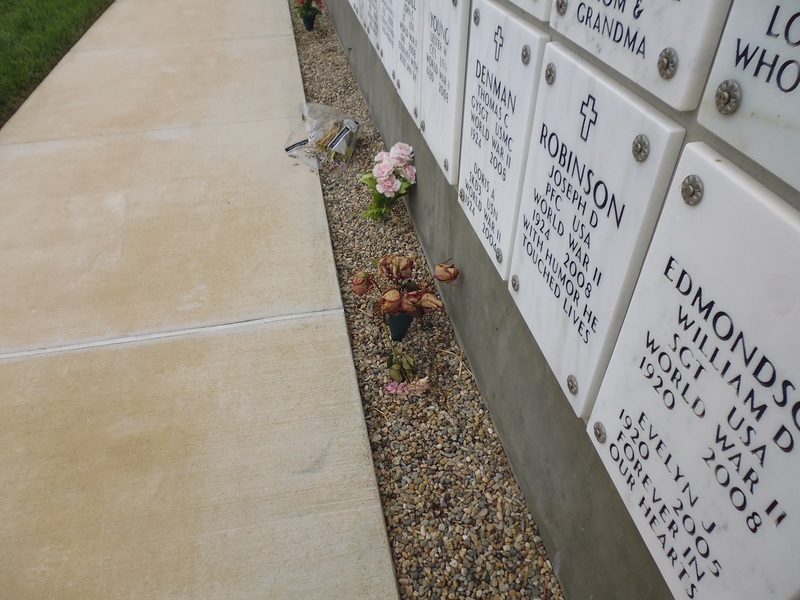 My father’s ashes are there and my mother’s ashes and possibly mine will be there as well. I forwarded your article to the NCA. Lets see what kind of response I get. Bravo! My CPO Dad is eternally stationed there & salutes you from the peace that passeth all understanding. I stand by my earlier comments that seem to have disappeared from below this article. The place is an embarassment to all who lie at rest and everyone who sees it. You are kind and faithful to give this new guy more time. I remain concerned that this is another example of the slights our veterans face. I’ll stay tuned. My dad is there and my mom should be, I just can’t bring myself to put her there while it looks like it does. Thank you for your vigilance. Judy: thank you for advocating for those who no longer can and the rest of us to restore this sacred ground. It is indeed a very special place both by location and purpose and deserves proper care. I am disturbed that there seem to be excuses being made for why trees are being removed and not replaced. Clearly, somebody is not doing their job. I appreciate your consideration of Mr. Ledbetter’s situation having to direct two national cemeteries with what appears to be insufficient staff and possibly insufficient other resources and funding. It appears to me like the difficulties coincide with the construction and opening of Miramar. Is that just “coincidence” or “consequence”. This is a corollary to the problems we see with the VA Hospitals. Everyone wants to wave the flag on Veterans Day and Memorial Day, but when it comes to properly honoring the sacrifices…. well …. on to the next parade! I will be forwarding your article to my Congress person and I urge you and others to do the same. Here again, they like riding in the parade and some of them keep wanting to send more service members into harms way, but they somehow can’t seem to ensure that proper care is rendered to these facilities. Time for Government Accounting Office or some such agency to do an independent investigation of a) why did this facility fall apart so badly ?, b) why has the renovation contractor apparently not performed and/or c) did the contract have sufficient enforceable provisions to ensure performance or no pay? , d) is the budget and staffing for Ft. Rosecrans and Miramar sufficient? C’mon now…, let’s get real. I too have family at Ft. Rosecrans, and it is an undeniably beautiful site. Is it also a pristine and perfectly aligned garden with guaranteed shade for every visitor no matter what time of day? No, of course not! We’re in a drought, things settle, decay happens and there are cycles of life. My best 3-step advice: Take a clue from the united service that all who are buried there share; (1) Bring your own portable chair and shade (2) After you pay your respects to your beloved veteran, be sure to clean up not only your loved one’s grave site, but the ones on either side of them as well (i.e. pick up dead flowers or anything looking like trash as you see it), then (3) Salute them. Make it a win-win situation for everybody, and you may feel even better than after your usual visit; which is probably what your loved one would want for you anyway, if only they could deliver it. Wise up. Well I guess change is about to happen at Ft. Rosecrans again. Last month the Cemetery Director’s job was advertised on USAjobs.gov. Guess Mr. Ledbetter is leaving. Seems like they only last a year…..why is this place so hard to manage? In July I was there and visited Mike Monsoor’s grave. A contractor was nearby working on a rock wall. In the hour or so I was there, he only laid about 3 stones, rest of time he was talking on his cell. Sounds like someone is not managing or paying attention to whats going on.